This is an exceptional, high security motorcycle storage facility, providing absolute privacy and a range of excellent security features. 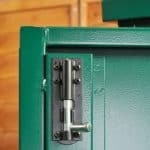 Offering enough space to store two bikes, the building benefits from a 10 year anti rust warranty, hot dipped galvanised steel construction, a 5-point locking system and very wide, robust double doors. 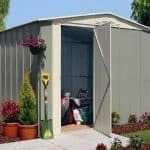 Unlike a lot of metal garages, this one also comes with a great, tough metal base. 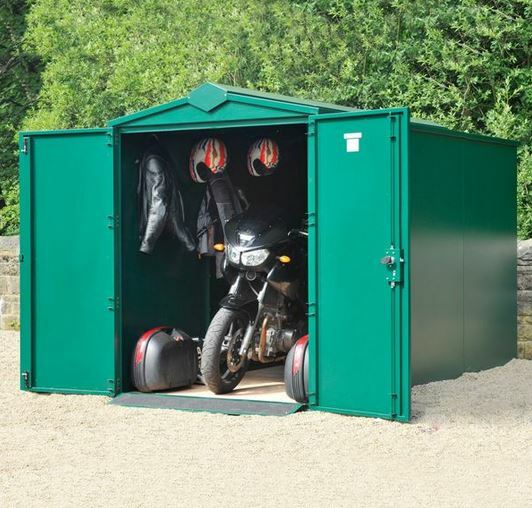 This is an incredible, high-end metal bike storage shed that is capable of accommodating two motorbikes. It isn’t surprising to see that this garage comes with an apex roof. This is the preferred roof design used by most manufacturers on the majority of modern sheds due to its natural water drainage abilities and height-increasing benefits. Its shape ensures there is additional height inside the building, which means you can ride your bike out of the building without the risk of banging your head. The fact it makes sure all water runs down and away from the actual sides of the garage also helps to protect it against rust. We like that the building comes with tall 1.76m eaves and a roof height of 2.03m. The doors have equally impressive measurements, stretching out 1.42m wide and 1.69m high. 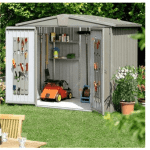 Then there’s the compact depth of 3.33m and width of 1.52m, giving you a great amount of internal storage, without taking up a huge amount of space in the garden. 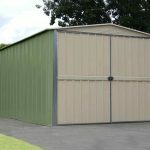 Exceptional strong and heavy weatherproof gauge steel panels are used in the construction of the garage. This thick cladding means you are left with a very tough exterior, while the strong metal frame helps to keep the interior fully supported. What we find particularly noteworthy about the materials used throughout the construction is that they are resistant to crowbar damage. This gives you an idea of just how secure the building really is. Another positive feature is the strong metal base provided. 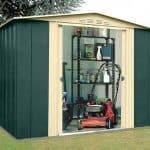 Typically it’s uncommon for metal garages to come with a floor as they are designed with very heavy storage in mind. However, the floor that comes with this model is incredibly strong and sturdy, ensuring the weight of your bike will never pose a problem. It even features a ramp which allows easy entry and exit from the building. The benefits just keep coming with this garage as it also requires absolutely no maintenance. 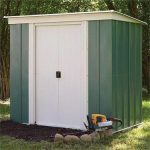 It’s not unusual as metal buildings in general tend to come with fairly weather resistant protection. 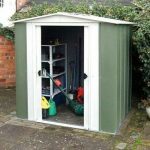 However, the zero maintenance still makes this a very good value for money storage space. It also comes in an attractive green colour so you don’t need to paint it to make the building look more attractive. For peace of mind, the manufacturer includes a 10 year anti-rust warranty. When you’re storing vehicles, it’s important to ensure you have plenty of room to transport them both in and out of the garage. Therefore we’re impressed that Asgard have placed the doors at the very edges of the building. This means you benefit from the full width of the garage, giving you an extraordinary amount of room to ride your bike out of the building. 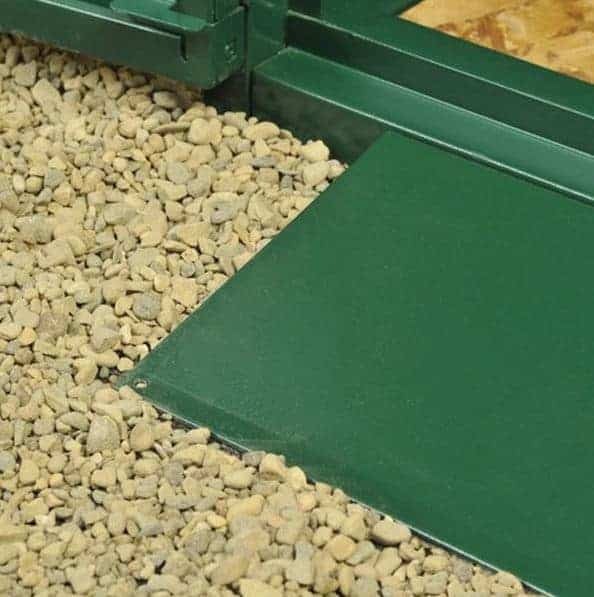 They also have an incredible reinforced design which makes them both difficult to close on their own and extremely difficult to break through. The garage doesn’t feature windows but you don’t need to worry about lighting or condensation. Ventilation panels have been added to each side of the building to provide a good amount of airflow, eliminating the risk of condensation. There is also an electrical mounting plate which lets you quickly and easily attach an electrical kit if lighting is likely to be a problem. Of course you will need to take into account the extra money you will need to spend on this, but it is a great feature to have. If there’s one thing Asgard always do right, its security. When storing your bike, you want to know that it is going to be safe from thieves. 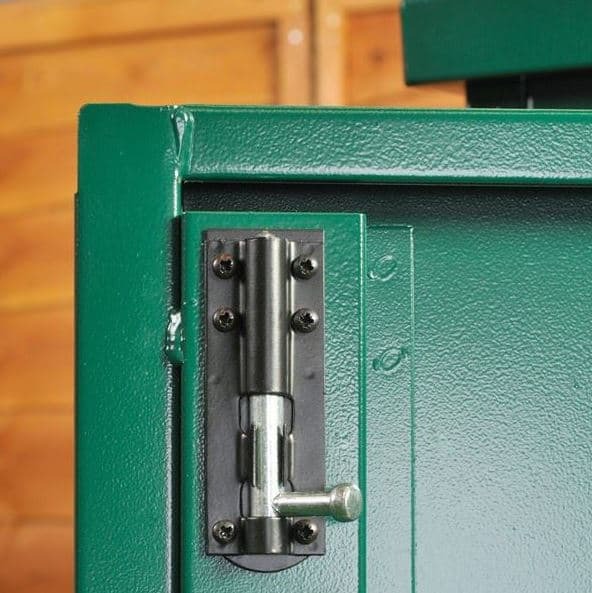 With this garage you really don’t need to worry as it comes with an incredible, ultra-secure 5-point locking system. This system is drill and pick resistant. When you take into account the metal is also crowbar resistant, you realise just how amazingly secure this garage actually is. We’d even go as far to say that it is almost impossible for anybody to break into it. 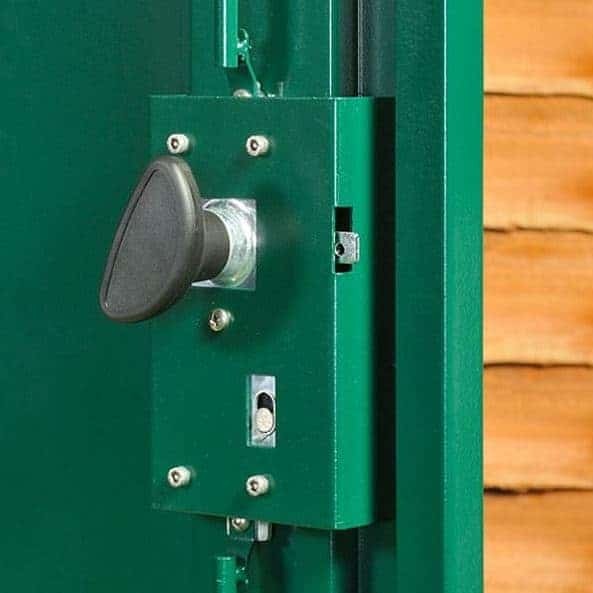 That is why it has been UK Locksmith Association approved. The privacy on the building is also impressive. With not one window added to the design, your bike, or whatever else you choose to store, will always be hidden from thieves. The Plus edition of this Asgard motorcycle garage comes with the much of the same extras as the standard edition. However, it does state that it comes with a free ramp so that’s one thing you save money on. You don’t actually need any of the extras on offer as the building already boasts a range of features that give you everything you require. However, you may find the Eyelets and hooks worth buying. 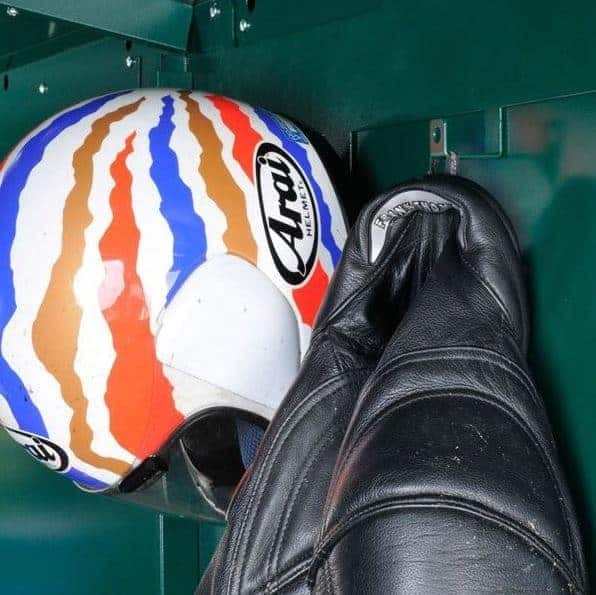 They increase the amount of storage available and provide a safe, useful place to hang all of your equipment such as your leathers and helmets. They can also keep cables out of the way if you decide to install an electrical pack. We like that you don’t need to spend any additional money on this garage. It’s an obvious advantage and helps to add to its overall value for money. Full marks go to Asgard for this exceptional garage. 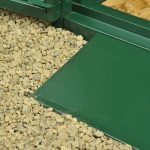 No expense has been spared to make it secure and impeccably durable. You can fully expect the parts of the building to last at least 10 years. That’s without treating it every year so in that respect it is actually very impressive. This is the larger sized motorcycle garage in the Asgard collection. It offers enough space for two bikes and gives you optional hook space. The built in superior quality shelf also adds to its storage potential. Considering this is larger than the non-Plus edition, it is still just as simple to assemble. It will be pretty heavy due to the quality of the metal used, but the instructions are well detailed and very easy to follow. Taking everything into account, this motorcycle garage supplies great value for money. You don’t need to spend any more money once you’ve bought the building and its level of security and the peace of mind it gives ensures you never have to worry about theft and the cost of replacing the bike. 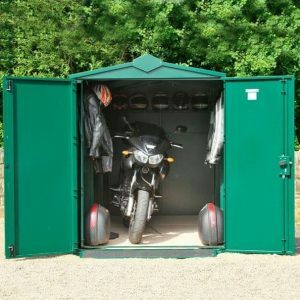 Final Thoughts: This is one of the best motorcycle storage sheds we’ve reviewed and we highly recommend it. What really sets it apart is its full security benefits. You can’t get a more secure locking system. It also gives you more than enough storage space and is guaranteed to last a decade. Once you’ve forked out the initial high cost, in the long term you actually end up saving money as you don’t need to maintain it at all.